If you’ve ever wished your car, truck or SUV looked more sinister, Chevy has the answer. Their “Midnight Edition” package delivers a slightly menacing, blacked-out appearance that’s guaranteed to draw attention. Is it CSIS? A foreign leader? Or just a soccer mom who wants something different from her ride? Okay, it’s probably the latter, but at Budds’ we say “What’s wrong with that?” The Midnight Edition is also a great way of standing out from the herd at the mall. You can get the Midnight Edition package on the Impala sedan, the Tahoe and Suburban SUVs, the Colorado mid-sized truck and the Silverado. Some aspects of the package are the same on every vehicle—black paint, black wheels, black interior—but others vary. Here’s what you get in the Midnight Edition of each. A muscular full-size sedan, the regular Chevy Impala oozes presence even before it’s given the Midnight treatment. A wide grille and narrow headlights make it seem low, while the crease running from headlight to rear door handle adds length. The car comes in three trims: LS, LT and Premier. Both LT and Premier are eligible for the Midnight Edition package which adds 19” wheels with black-painted pockets plus the black trim. For Chevy’s mid-sized truck, Midnight Edition is available on the LT, Z71, and ZR2 trims. To an already well-equipped truck, this adds black alloys, (18’s on the LT, 17’s on the Z71 and ZR2,) a black grille and a black bowtie. In addition, the Z71 gets an all-weather floor liner and a spray-on bed liner. The ZR2 also gets a black sport bar and lights behind the cab. The big three-row Tahoe SUV has two trims eligible for the package: LT and Z71. A 5.3 liter V8 is standard although a 6.2 liter is an option in Premier trim. The Z71 Tahoe has a distinct off-road orientation and comes with 4WD, a transfer case, and skid plates. If the Tahoe isn’t big enough, the Suburban should do the trick. Like the Tahoe, this comes in three regular trims—LS, LT, and Premier—plus special variants like Z71. Again, as with the Tahoe, the Midnight Edition package is available on the LT and Z71 and provides the same upgrades. If you want your Silverado dressed up with the Midnight Edition package you’d better be looking at the 2500HD. 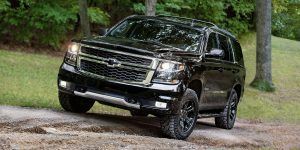 This full-size, heavy-duty pickup gets it on Crew Cab versions of the LT trim and LTZ-spec trucks with the Z71 package. Look for the black grille and bumpers and black assist steps as well as the 18” alloys. To complete the air of menace, the LTZ also gets black door handles, side moldings, and mirror caps. As an aside, LT and LTZ trim Silverado HD’s come with a 6.0-liter V8 good for 360 hp and 380 lb-ft of torque. In other words, they have the grunt to go with the Midnight looks, and they put it to the road with either 2WD or 4WD. Limos and official vehicles are almost always black, perhaps because it projects a serious, purposeful attitude commanding respect. Chevy’s Midnight Edition package lets you get a little of that—and don’t you think you deserve it? The Midnight package is available on sedans, SUVs, and trucks. To learn more, visit Budds’ Chevrolet Cadillac Buick GMC and start a conversation with one of our Midnight specialists. And in case you’re worried, don’t be—our showroom is well lit.